Thanks to this script, now there is an online tool available, where you can prepare your dumps no matter what OS you use. The manual dump editing, described in the initial article, is quite a long and boring process. Moreover, if you’re not careful enough, any mistake can lead to a wasted tag. In order to change this the redditor ShoGinn made a script which greatly simplifies the process. PC with Linux OS. A Linux virtual machine will work too! Key used for amiibo decryption and encryption. If you followed the original article, you may already have it somewhere. Otherwise just find it in Google. 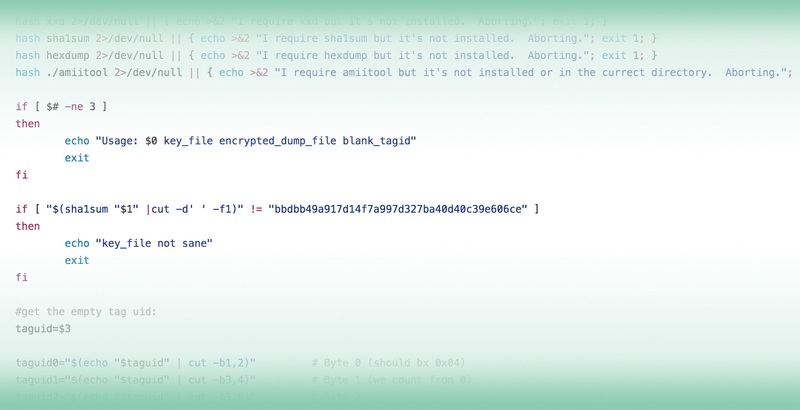 Put the script, amiitool, the key and the dump into same directory. ./Arduino_amiibo_tool.bash "key name" "dump name" "blank tag UID"
Now just copy the output and paste it into the Write_Amiibo sketch. That’s it! What subreddit did this script come from? ShoGinn contacted me privately on reddit. He needed some explanation on the method, although we analysed bkifft’s amiiscript.sh which has some neat bash scripting techniques in it. Later he sent me a script for review, and after a few tweaks we decided that it is ready to be published. Thank you very much for all your help and your sharing! Hi, to make this work on Windows you’ll have to find equivalent tools and make it yourself. thank you! 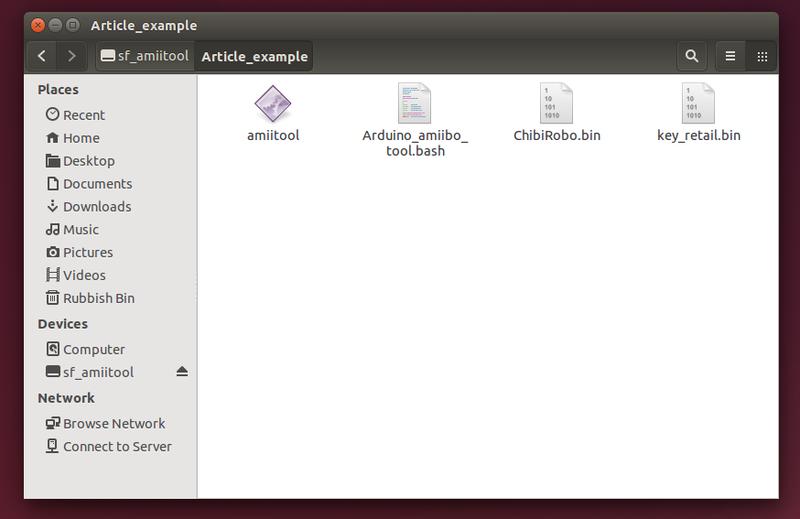 I finally managed to write some amiboo fast, so long ago somebody did not work but for the rest a great tool! Congratulations and thanks for the work done !! Hi Daniele! I’m glad that you finally got it working! Thanks for your donation and feedback! Nice, works great lol. I was literally thinking about writing up a quick script like this to do something similar. But beat me to it. Thanks again! If you have any feedback or better practices I would love to see them! Yeap will do! Your script is fairly simple and elegant (may be diminishing returns to focus on it more haha). I’m likely going to shift my focus onto hardware interface and software integration. So removing the middle step of taking the hexdump to manually paste into a programming sketch. Multiple ways, either I may just do a python script to interface an arduino with this routine, or play around with a raspberry pi and make this portable with wifi connectivity. Or I may look into bulk tag programming using anti-collision of tags. I don’t know, so many things to play around with. I agree not much let to be done. Kostia has done a great job making it on his webpage now which is cool. I was researching the RC522 and Raspberry Pi integration but its quite a bit more work with those GPIO libraries. The arduino programming language is still new to me, so I wanted to make the hex dump integration a bit more elegant too.